We at BuyIndieComics.com have talked a good bit about Carpe Chaos and its founders, Jason Bane (that’s his real name) and Eric Carter (bearded wonder). All Magic Cards face up on the table, we consider them sponsors here at our happy place. And through The Antidote Trust, they are even our partners in conventions and crime – we’ve exhibited with them several wonderful times. But we would not partner with them or even talk so highly of them if we did not respect their hard work and determination. 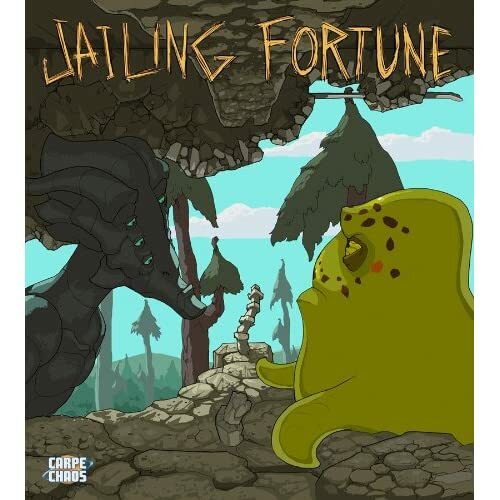 And Jailing Fortune is a prime example of why we appreciate Carpe Chaos. If you’re like me and you miss having classic science fiction around – adventurous metaphors, future science, imaginative worlds like our own but somehow completely different – you will love what Carpe Chaos is doing and Jailing Fortune is a great place to start reading their materials. It’s at least one part, honestly unintentionally Enemy Mine (one of my favorites) and the rest is beautiful art from Anthony Cournoyer and smart storytelling from Eric Carter. There’s an entire chapter of Jailing Fortune that has no dialogue and it’s completely dependent Carter conveying incredible detail to Cournoyer who executes it masterfully. And the ending, well, it inspired me to write this glowing post. Now, I will say that the work that Carpe Chaos produces is mature – there is some swearing and certainly some extreme violence but none of it is uncalled for and all of it is appropriate for the real feeling that the stories generate. The art, while it seems like something for kids, it’s really just an incredible contrast to the often mature stories. I will even go so far as to say that some of the writing is “difficult” but in a good way. When I finish a story from Carpe Chaos, I feel like I’ve done something – their work is not meaningless fluff, it’s a lesson to let settle into your brain. Well, I think you get it, I’m a fan of Carpe Chaos and the work they do – keep up the great work guys. And if you have not read anything from them yet, check it out, some of their stories can be found online for free! This entry was posted in Columns and tagged carpe chaos, carpechaos, CarpeChaos.com, enemy mine, Eric Carter, jailing fortune, Jason Bane, science fiction. Bookmark the permalink. Follow any comments here with the RSS feed for this post. Post a comment or leave a trackback: Trackback URL.